Gmail App for the Google Nexus! The Gmail app for Google's Nexus One phone is really cool and has four amazing features to it. And since the phone runs Android 2.1, this adds a couple of new features to the native Gmail application. You can get the Android Gmail app from Gmail Android page on mobile.google.com/android. Quick contact badge: A handy box that shows all of the ways you can reply to a contact — including email, chat, SMS, and Facebook. 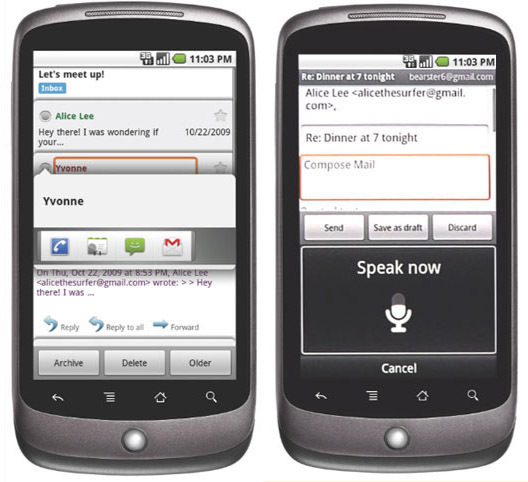 Voice input: Write your mails with voice. Cool na? The app supports Multiple Gmail accounts and lets you sync multiple accounts to the same device and switch between them without leaving the app. A handy 'undo' link makes it easier to retrieve messages when you hit archive or delete by mistake.